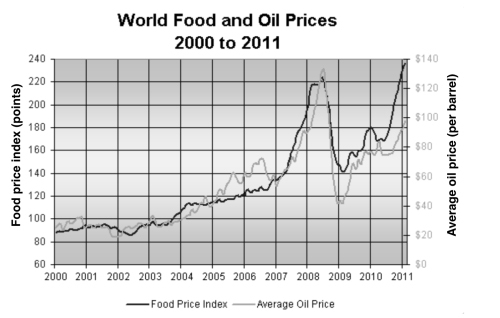 The line graph shows the price of food and oil around the world over eleven years, from 2000 to 2011. There is a high degree of correlation between the price of food and the price of oil, which largely rise or fall together over the period. In 2000, the food price index stood at about 90, steadily rising over the next seven years, except for a slight fall around 2002. Between 2007 and 2008, the price skyrocketed from about 140 to 220, before dropping sharply over the next year. Between 2009 and 2011, the price rose quickly, exceeding the previous high price and reaching almost 240. The average oil price followed a very similar pattern, growing slowly until 2007, except for a few slips back. Around 2007 it dropped suddenly and then soared to a peak of around $130 per barrel in mid-2008. This was followed by a sharp drop to just $40 in 2009, and from then until 2011 the price rose, more than doubling to a $100. For at least a few millennia, and perhaps longer, humans have enjoyed sports that could be considered violent. From the Roman gladiators to modern heavyweight boxing championships, it is evident that people like to watch men fighting one another. However, in the twenty-first century, some people believe there is no place for such barbaric activities. The leading argument in favor of banning violent sports from TV is that it leads to the protection of children, who might otherwise see these events and attempt to copy them. Campaigners against violence on TV cite evidence that suggests children are highly impressionable, and would idolize sportsmen who use violence. This could lead to an increase in violent activity among children in the wider society, with other children getting hurt. On the other hand, it should be noted that actual violence and so-called violent sports are quite different. In sport, there are very definite rules to be followed. If someone breaks these rules, he or she is punished by a referee. While boxing or martial arts may seem violent to an uninformed spectator, they are events featuring highly skilled athletes who have agreed to participate, and are watched by medical professionals at all time. This seems rather different to other forms of violence. 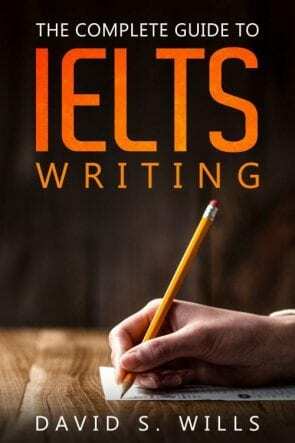 In conclusion, it is possible that banning certain sports from TV or halting their inclusion in international sporting competitions may be beneficial to society, but the argument is not wholly convincing. These sports are not violent in the traditional sense, and they probably don’t send a bad message to children.